Note: While this is a positive development, and a step in the right direction, we’re “not out of the woods yet”! SLS plans to cut 3x as much timber this year than last, and the year 2 and 3 logging plans are only put on hold while the South Saskatchewan Regional Plan is being considered. We have a long way to go before we can be sure the logging has been stopped for good. Pincher Creek, AB – A decision this week by the Minister of Environment and Sustainable Resource Development to put a hold on logging in a protected area in Southern Alberta has community members and conservationists applauding. On Wednesday, October 10 the Pincher Creek Echo ran a story that has now been confirmed with calls the office of the Minister Dianna McQueen: years two and three of clear-cut logging in the Castle Special Place are being put on hold pending the outcome of the ongoing South Saskatchewan Regional Land Use Plan. Logging by Cochrane, AB based Spray Lake Sawmills in the Castle, designated a protected area under the Special Places 2000 in 1998, began last winter, and was met by the longest protests on an environmental issue in the province’s history. It culminated with four local citizens being arrested after they and dozens of others braved minus 30 temperatures to protest the clear-cutting. Logging will take place in the Castle this fall, but will be limited to an area accessible by the existing roads built by Spray Lakes last winter. This logging will complete year one of the three-year logging plan. Spray Lake Sawmills will then decommission the access road. While the Minister has halted logging slated for years two and three of the current three year logging plane, cutting is still scheduled for this fall. The Castle Crown Wilderness Coalition will be in court on November 1, 2012 to challenge the permit granted to Spray Lake Sawmills and try and win a reprieve for the Castle from logging this autumn. 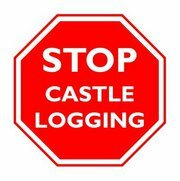 You are currently browsing the Stop Castle Logging blog archives for October, 2012.